Having just watched opening night of Opera in the Heights’ The Pearl Fishers, Georges Bizet’s youthful immersion in frothy Orientalism, I’m inclined to start the Brian Byrnes Opera Fan Club. What, you could rightly fire back, isn’t he the guy who stages all those swordfights? Like at the Alley? Or Houston Grand Opera? Or anyplace else where fine swordfights are sold. Yes, he is that guy. Yet at the conclusion of his third OH outing (the first two being La Boheme and Don Carlo), I’m ready to declare I won’t go see any opera he doesn’t direct. Well, all right, that might be a bit harsh. But Byrnes’ full, rich, human and utterly natural way of moving people around the stage forces me to think he could make the dumbest opera make sense. There’s a lifetime of work in that! The Pearl Fishers is exactly what Europeans were lapping up throughout the 19th century, gauzy adventures in essentially a galaxy far, far away. It’s the tale of a love triangle similar to the one the composer would milk so brilliantly later in Carmen, except here the two guys fighting over the girl are best friends. There’s a religion that makes no sense, along with crowd reactions that make no sense – most of them driven by their religion, which all adds up, in the 1800s, to the perfect escape from oh-so-French reality. People pray to odd gods, flash knives at odd times and generally behave in the odd ways fishermen in Ceylon might if you’ve never met a fisherman from Ceylon. Still, there is the music – incredible, awe-inspiring, lyrical, mildly exotic, at least some of which presages the far better use it gets put to in Carmen. Several key moments fling forth the emotional promise fulfilled by “Micaela’s Air.” And in a delightful doff of the hat to that fact, Brynes even gives the tenor a chance to lift a flower from the beach before his big solo, a delicious homage to Don Jose’s famous “Flower Song.” Strangely, the two greatest melodies tucked away in Pearl Fishers are spent in Act I, meaning that the best moments of Acts II and III are Bizet’s effective reprises of that pair of songs. 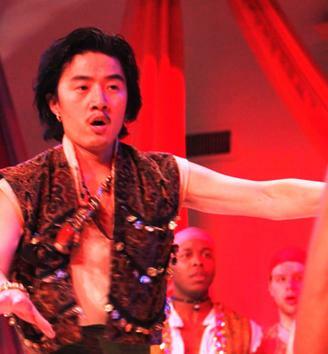 In the opening night Emerald cast, baritone Yoonsang Lee as Zurga sang and acted his way into as much believability as this plot could hope for, truly living the lyrics one line at a time – a signature of Byrnes’ operatic directing. Lee’s early duet with tenor Fabian Robles as friend-rival Nadir, “Au fond du temple saint,” essentially functions as the opera’s rather strange second-hand love duet – two guys remembering the night they first laid eyes on the girl. For his part, Robles initially seemed a little on the light side vocally, a regular occurrence in French operas anyway; but by the time he sang the opera’s other greatest hit, “Je crois entendre encore,” he had located enough gravitas to keep us listening all evening long. While left out of these dynamite moments, soprano Ani Maldjian brought exotic beauty and no shortage of coloratura flittering to the role of Leila. Daymon Passmore did well in the bass role of Nourabad, though he had so little to do at times it was a challenge to even Byrnes. At the very least, in honor of Teddy Roosevelt, someone should give this guy a bigger stick – his Act III outburst of anger banging his staff on the ground was the sound of a 1950s nun armed with a plastic ruler. You’ll see what I mean. The OH chorus sang with its usual tight-knit musicality, reminding many of an excellent church choir. 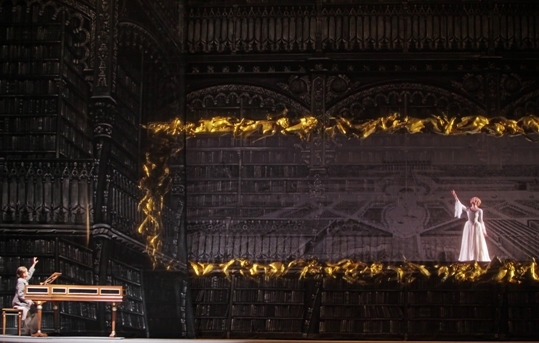 And one added attraction is dance choreographed with visuals out of an Indian temple by Houston’s own Dominic Walsh. 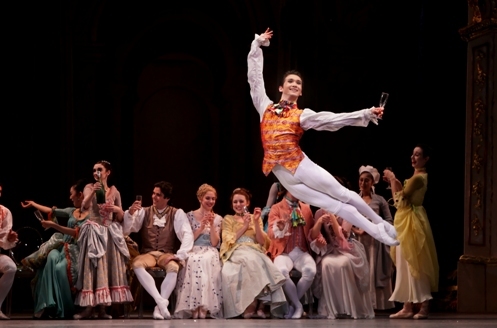 It’s danced effortlessly by two members of his company, Marissa Leigh Gomer and Ty Parmenter. 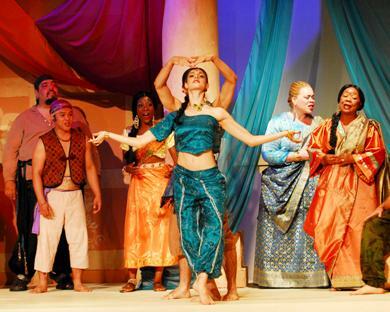 The Pearl Fishers, conducted by Linus Lerner, closes out the Opera in the Heights season. There are more performances left, even if many are sold out. Do whatever you can to get tickets to see a young opera company do wonders with the brilliance of a young composer we know went on to give opera its single greatest hit. Photos by Ted Viens, Sergio Garcia Rill and Gwen Turner Juarez. (top) Robles and Maldjian; (middle) Lee; (bottom) Gomer and Parmenter. Imagine all the goofy conspiracy theories you’ve heard about everything in your life, from the Kennedy assassination to the Apollo moon landings to the terrorist attacks of 9/11, and then ponder for just a moment what it would mean if they were all true. Turning it around, if they were true, how would we best go about connecting all the dots? It would be like a 10,000-piece jigsaw puzzle, except maybe attempting it upside down, in the dark. 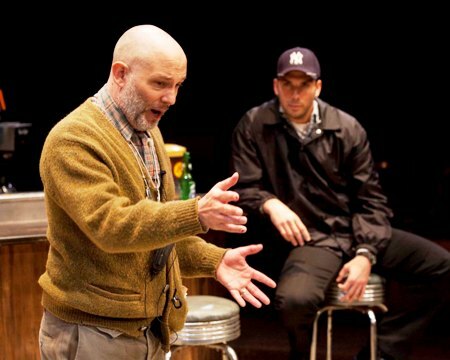 That’s more or less the task Steven Dietz sets before himself – and to some degree, before us – in his play Yankee Tavern, focused on a tangle of wild ideas spinning off from 9/11. We’ve all met people who believe in such things, and we’ve all had to learn to file those people away right along with their rantings. They get in the way of the basic calm, the basic belief system, we need to be productive. So Dietz, ever the trouble maker here, keeps insisting that we consider the big What If. The tavern in question is a rundown piece of New York City real estate, surely one of few with such limited monetary value, run by the son of the man who owned it before allegedly committing suicide (Adam by name), to the growing distress of the woman planning to marry him (no, not Eve – Janet). As a couple, they have their issues surrounding secrets and trust, but then again, who doesn’t? Things go increasingly wrong, however, when the bar’s longtime beloved homeless guy (Ray) gets into one of his conspiracy rants about 9/11, and even more so when his hysteria gains traction from the comments of one mysterious stranger in a Yankees cap (Palmer). A dizzying array of suspicions are raised in the course of these entertaining and brain-teasing two acts, touching on everything from Adam’s fidelity to Janet to the U.S. government’s possible complicity in attacking, well, itself. 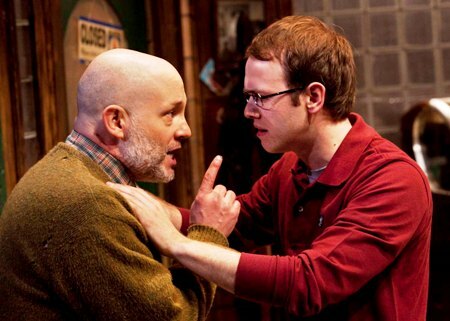 As directed by Stages producing artistic director Kenn McLaughlin, Yankee Tavern blends the pacing of a Hitchcock thriller with the barrage of weird revelations remembered from ancient Twilight Zone episodes. There are supernatural overtones, maybe, as in Ray’s conversations upstairs each night with ghosts including Adam’s father. But mostly the tension comes from real possibilities about real historical events – along with the real question of what we’re willing to consider believing. What we believe (and, by process of elimination, disbelieve) helps hold us together, helps make us who we are. If that were to change suddenly, Dietz seems to be asking, what happens then? The ensemble piece is expertly acted, beginning with a scruffy, shaved-headed, gray-bearded version of Philip Lehl as Ray, the guy whose crazy blurtings seem, with every new piece of the puzzle, just a little less crazy. Adam Gibbs and Rachel Logue are pitch-perfect as the more-troubled-than-they-know young couple, as especially she comes to doubt that he is who or what he seems. And David Matranga is believable as the enigmatic Palmer, whose actions and motives are never completely explained. Jodi Bobrovsky delivers an eye-catching set that contains the whole tale with a dollop of claustrophobic delight. The lighting design by John Smetak and especially the eerie sound design by Michael Mullins contribute mightily. As befits a play making or even entertaining such outrageous claims about an event that happened before the world’s eyes, the story concludes with loose ends and mind-bending uncertainty. Still, I’d swear I heard some one-line allusion to “Yoko Ono and the Bay of Pigs.” I Googled exactly that and got zillions of references to each, of course – but none to both. Really, after what she did to the Beatles, would we still be all that amazed if there were something to it? Photos courtesy of Stages: (top) Lehl and Gibbs; (bottom) Lehl and Matranga. At the end of Stanton’s Welch’s ambitious storytelling extravaganza known simply as Marie, we see the famous woman’s only surviving daughter waving goodbye to her spirit, lit against the gardens of Versailles. And we certainly know how the daughter feels, since Houston Ballet’s second try at the work is now history as well. If anything, thanks to lead Melody Herrera’s embodiment of Antoinette, Marie has taken on even greater grandeur in the years since its world premiere. In this rather intense (especially for ballet) tale of the French Revolution, the tragedy at the end was far more powerful than before, while the happy times near the beginning (like the dance above from Marie’s carefree revels at Versailles) were even happier. The contrast between these two emotions was every bit as dramatic as that between the wealthy court dwellers and the smudge-faced, rag-wrapped rebels who sound their death knell in the shadow of the guillotine. One of the quirks of Welch’s rendering is that, while Marie is married to the king of France (who, Texas-style, seems to prefer hunting) , she saves her most passionate dancing for a Polish count with whom she has an affair. This is doubly quirky considering that classical ballet has no shortage of men torn between two lovers (including, of course, Prince Siegfried and those swans, Black and White); but not very many women. I suppose that at this point we’re supposed to say: It’s good to be the queen. Still, Herrera and Connor Walsh were endlessly impressive as the lovers. In the strictest sense of storytelling, the closing visual of Marie waving farewell to her daughter seems something of an add-on. But one, it’s definitely an improvement over the guillotine. And it also underlines the unforgettable identity that Marie Antoinette brought to world history. Sitting in our seats at the Wortham Center, we really hated to see her go. Photos by Amitava Sarkar (top to bottom): Melody Herrera and Ian Casady; Charles Louis-Yoshiyama with artists of Houston Ballet; Herrera and Connor Walsh; Herrera waves farewell to her daughter.